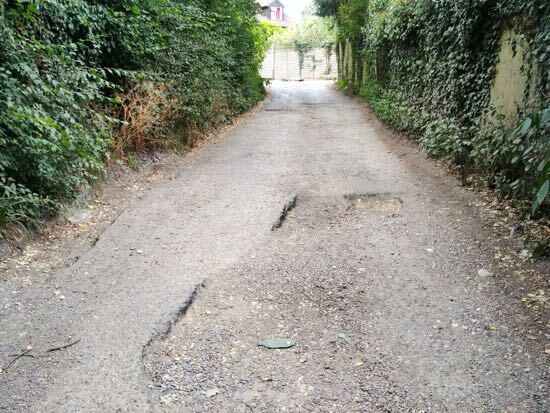 The potholes along Jonas Way, Brookmans Park, which runs between Moffats Lane and Gobions Open Space car park, are to be filled in as a "temporary solution", according to North Mymms Parish Council (NMPC). 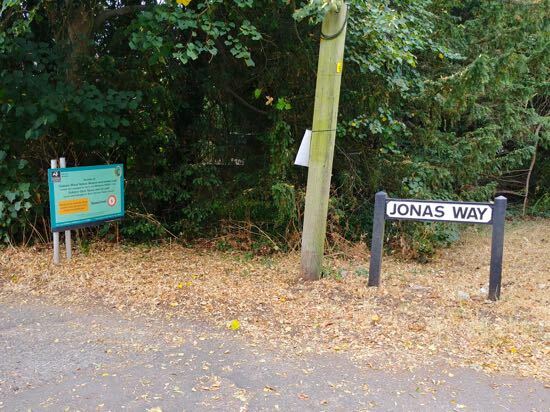 The local authority says it will provide the material for infill, and the Herts and Middlesex Wildlife Trust (HMWT) has, the council says, agreed to provide the labour. Parish council offers "gesture of goodwill"
According to the minutes from the NMPC meeting held on Wednesday 27 June, the plan was proposed by Cllr Jacqui Boulton as a "gesture of goodwill". It was seconded by Cllr Linda Saffer. Cllr Stephen Boulton abstained from the vote. 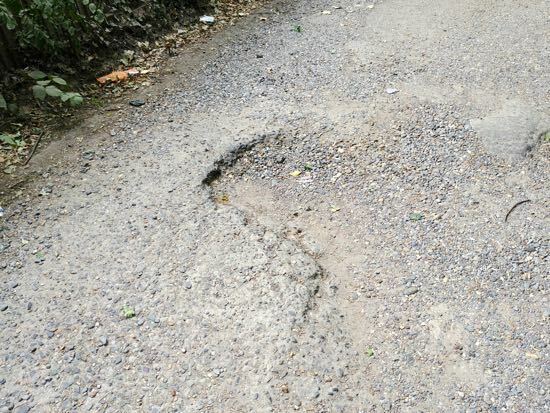 On May 22, the Welwyn Hatfield Times (WHT) ran an article entitled "Private road’s ‘crater’ potholes spark campaign for resurfacing work". 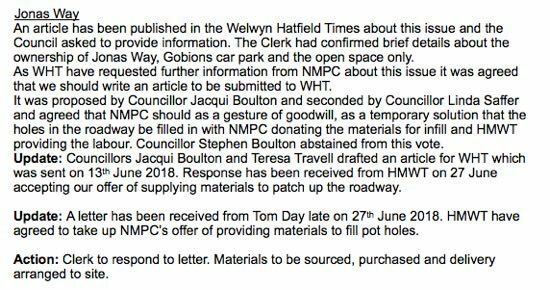 The WHT contacted NMPC for further information, and the council minutes record that an article was drafted for the newspaper by the council and sent on June 13. 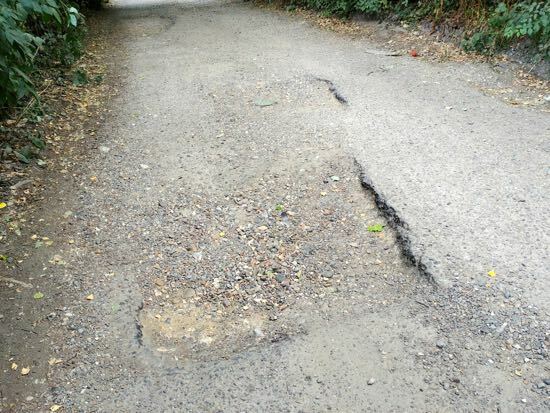 The local authority reports that two weeks later, on June 27, HMWT "agreed to take up" NMPC's offer to supply material to "patch up the roadway". 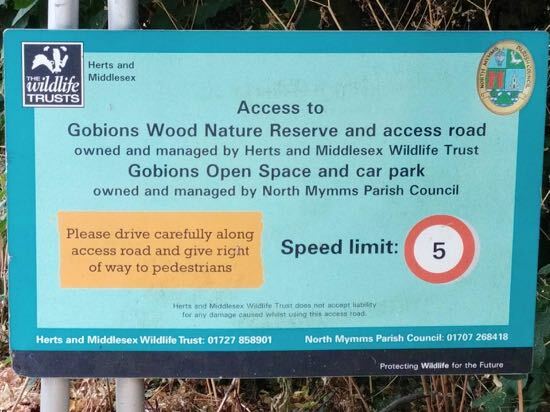 According to the sign at the top of Jonas Way, the access road is owned and managed by Herts and Middlesex Wildlife Trust; the car park it leads to is owned and managed by North Mymms Parish Council. The reference to the Jonas Way in the council minutes of 27 June (below) doesn't state when that work is due to begin. This site has emailed NMPC and HMWT for more details. Rob Hopkins, Reserves Officer for HMWT got back to us on Friday 27 July to say that the work would be carried out by volunteers so there would be no cost involved. He said that no date had yet been set for the work, but he expected it to take place in the next couple of months. He added that he had no idea how effective the work would be, but said that it would provide a temporary improvement. The council minutes can be found here. Presumably it's not a public right of way. @HMWTBadger should close it. Council can then find another way to their car park or fund a permanent solution. As always, you are welcome to add your comments about this piece by using the comments box below.